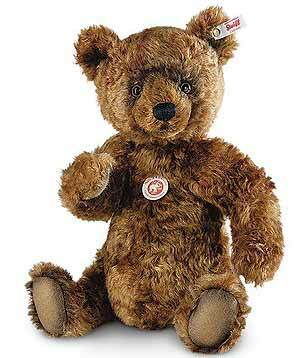 Grizzle Teddy Bear by Steiff. This beautiful hand made piece, in chestnut mohair, is three way jointed and wears the white ear tag, signifying this item as a Steiff limited edition, together with the famous gold plated Button in Ear. Limited edition of only 1500 pieces for the UK, USA and Ireland. Product details: safety eyes, synthetic filling material, with growl, size 34cm. Comes boxed, together with a numbered certificate of authenticity. Ursus arctos - The big "Grizzly" brown bear of North America has stepped out of the Great Plains and is eager to step right into your collection. We are proud to interpret this majestic symbol of the wild and bring to you a stunning bear. A very special and unique batik mohair has been produced exclusively for "Grizzle" to capture the bear´s striking "grizzled" golden and grey hair which is exclusive to these magnificent animals. His pupil eyes overflow with a plethora of ancient wisdom and wonder. Invite Grizzle into your home and be certain of something great.